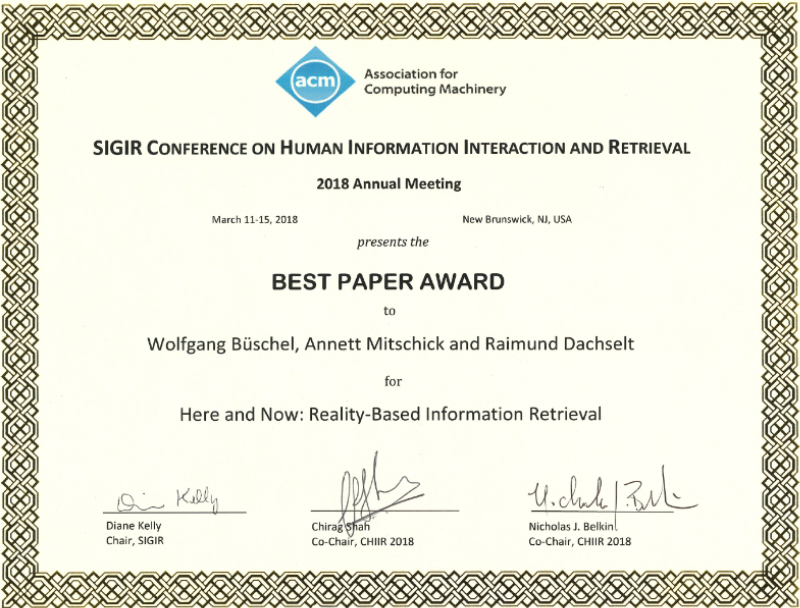 Wolfgang presented our perspective paper “Here and Now: Reality-Based Information Retrieval” at ACM CHIIR 2018 in New Brunswick, NJ, USA. We are very happy that our concepts and ideas for possible future information retrieval systems in mixed reality environments proved very popular. Our paper was awarded the Best Paper Award at the conference. Congratulations to the authors Wolfgang Büschel, Annett Mitschick and Raimund Dachselt! We also added some photos to our gallery. 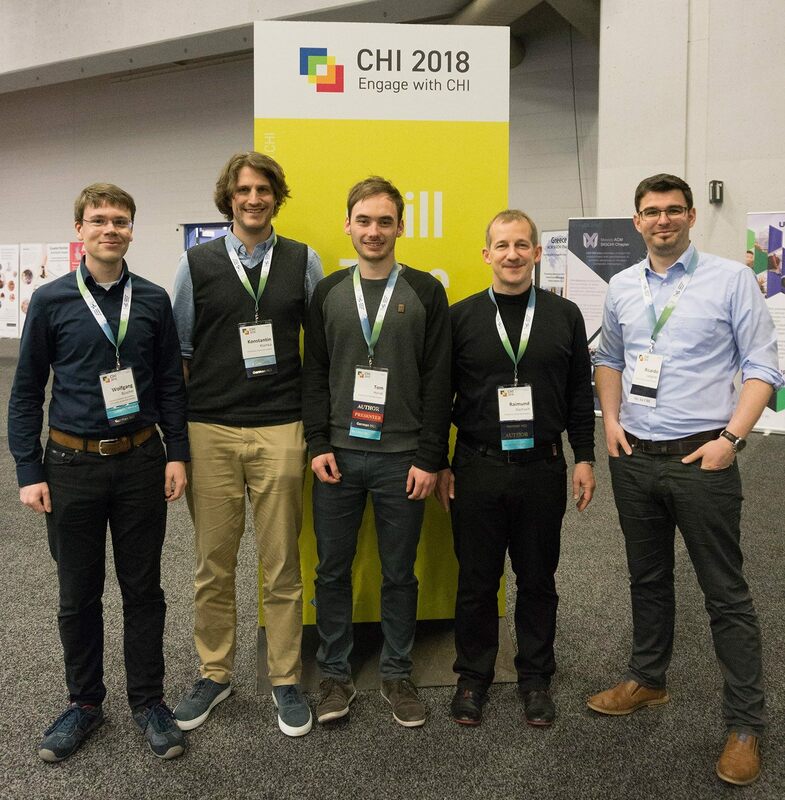 At this year’s ACM Conference on Human Factors in Computing Systems (CHI), our group presents nine accepted contributions – 1 full paper, 2 Late Breaking Work articles, 2 demonstrations, 1 co-organized workshop and 3 workshop contributions. The ACM CHI is the biggest and most important conference in the field of human-computer interaction and will take place in Montreal, Canada from April 21 to 26, 2018. We are particularly pleased about the honorable mention award (top 5%) for our full paper When David Meets Goliath: Combining Smartwatches with a Large Vertical Display for Visual Data Exploration. 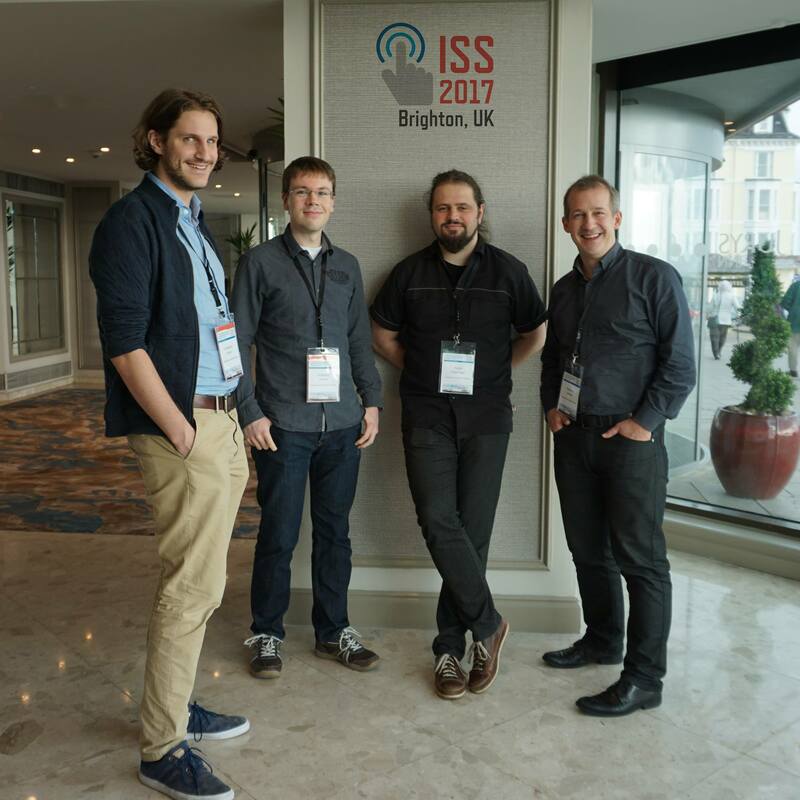 The paper is the result of a cooperation from Tom Horak and Raimund Dachselt with Karthik Badam and Niklas Elmqvist from the University of Maryland. The focus of the work is the combination of smartwatches and large interactive displays for data analysis. We will also present the corresponding prototype of this work in an accompanying CHI Interactivity demonstration. With Martin Spindler another PhD student of the Interactive Media Lab Dresden very successfully defended his dissertation on February 12, 2018. Congratulations from all of us on this impressive achievement, Martin! The topic of the dissertation was “Tangible Displays”, which comprises, among others, six (!) full papers and one journal article. We were able to win Prof. Dr. Jürgen Steimle of Saarland University as external supervisor. As the PhD was started in Magdeburg, some ceremonial traditions from Magdeburg enriched the festivity in Dresden. Afterwards, Martins success was celebrated in a restaurant at the campus of Technische Universität Dresden. 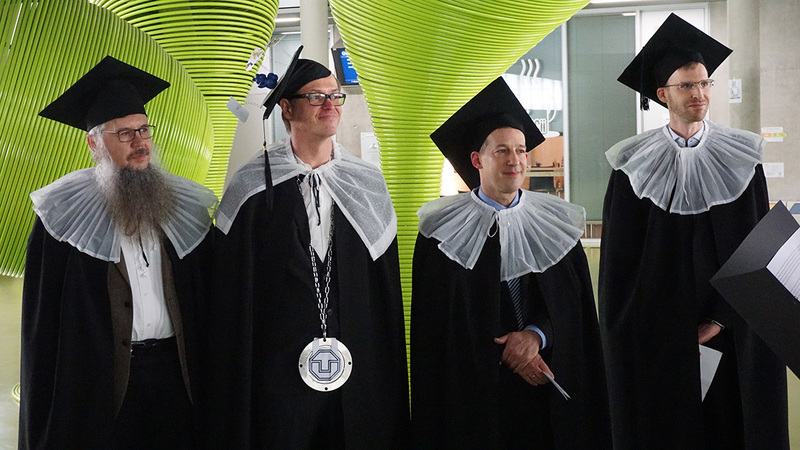 The doctorate supervisor, Raimund Dachselt, provides some impressions of this special day in a photo gallery. Again, we congratulate Martin on his dissertation and wish him all the best for the next chapter in his life. 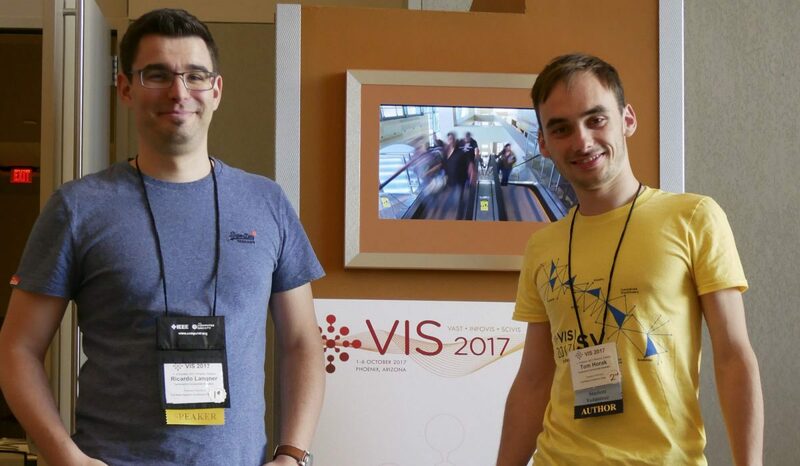 The European Conference on Visualization Eurographics/IEEE EuroVis took place this year from June 12 to 16 in Barcelona, Spain. 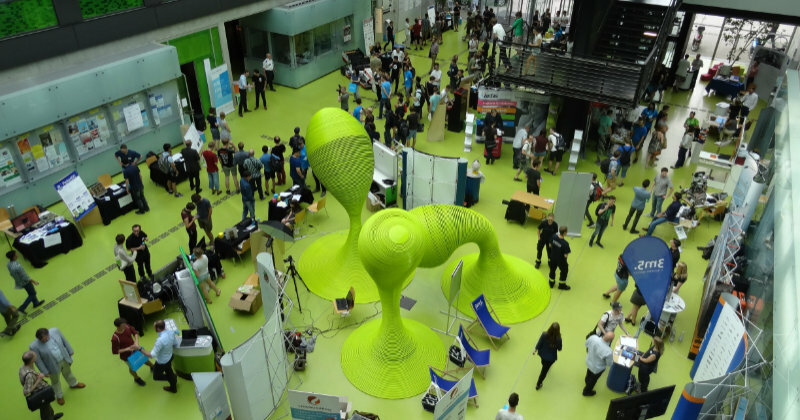 EuroVis is an annual conference organized by the Eurographics Working Group on Data Visualization and supported by IEEE Visualization and Graphics Technical Committee (IEEE VGTC). A number of additional workshops are co-located with EuroVis. The 8th International Workshop on Visual Analytics EuroVA 2017 was opened on Monday with Raimund Dachselt giving a keynote on Natural Interaction for Enhancing Visual Analytics. 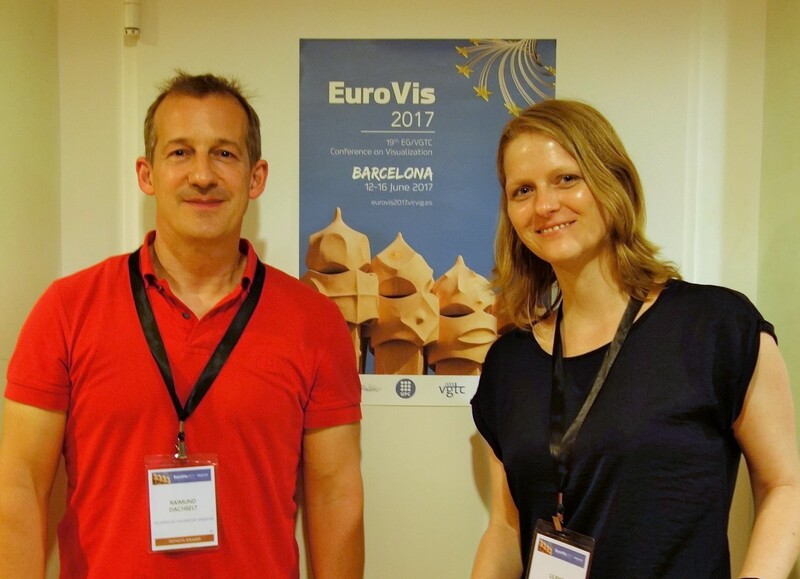 Beside Raimund Dachselt, Ulrike Kister represented the Interactive Media Lab Dresden at EuroVis this year. On Friday she presented our paper GraSp: Combining Spatially-aware Mobile Devices and a Display Wall for Graph Visualization and Interaction. In this work, mobile devices are applied to graph analysis as personal toolboxes with a variety of different analysis functions. All in all, we had a sucessful conference with many interesting talks and discussions. Some impressions of the event and our contributions can be seen in our photo collection. 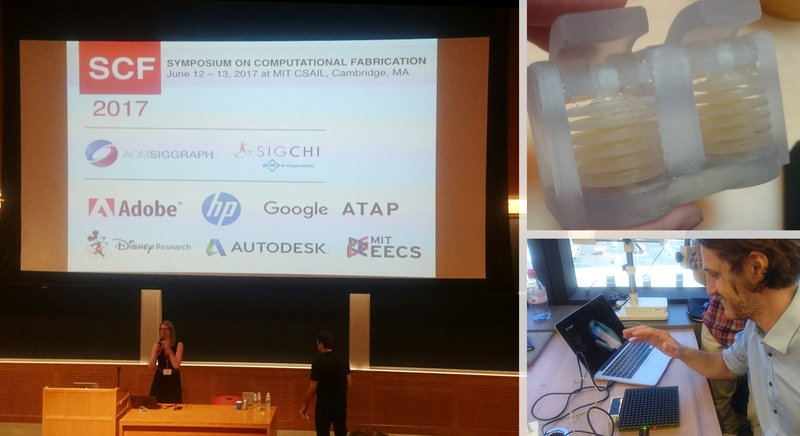 Konstantin took part at the ACM Symposium on Computational Fabrication (SCF) in Cambridge (MA) and gained exciting insights into current trends and research directions. The ACM Symposium on Computational Fabrication is an interdisciplinary venue that brings together leading experts from academia and industry in the area of computer graphics, geometry processing, mechanical engineering, materials science, architecture, human-computer interaction, robotics, and applied math.